Frank Stephens is an actor, a Special Olympian, and a disability advocate for those with Down Syndrome. 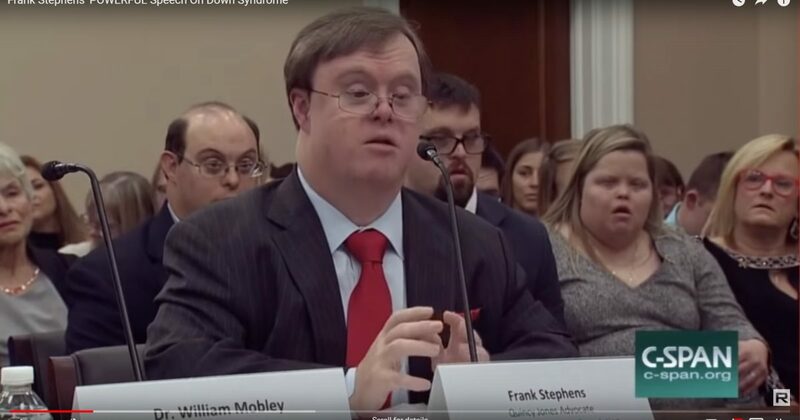 Watch the video, below, as Stephens addresses a congressional committee, promoting more research funding for Down Syndrome and protesting the abhorrent practice of aborting feti in the womb which have been identified with Down Syndrome. “Members of the Committee, just so there is no confusion, let me say that I am not a research scientist. However, no one knows more about live with Down Syndrome than I do. Whatever you learn today, please remember this. I am a man with Down Syndrome and my life is worth living. Sadly, across the world, a notion is being sold that maybe we don’t need research concerning Down Syndrome. Some people say prenatal screens will identify Down Syndrome in the womb and those pregnancies will just be terminated. It’s hard for me to sit here and say those words. I completely understand that the people pushing this particular final solution that people are saying that people like me should not exist. That view is deeply prejudiced by an outdated idea of life with Down Syndrome. Seriously, I have a great life. I have lectured at universities, acted in award-winning films, and in Emmy-winning TV shows, and spoken to thousands of young people about the value of inclusion in making America great. I have been to the White House twice and didn’t have to jump the fence either time. Seriously, I don’t feel I should have to justify my existence. But, to those who question the value of people with Down Syndrome, I would make three points. First, we are a medical gift to society, a blueprint for medical research into cancer, Alzheimers, and immune system disorders. Second, we are an unusually powerful source of happiness: a Harvard-based study has discovered that people with Down Syndrome, as well as their parents and siblings, are happier than society at large. Surely happiness is worth something? Finally, we are the canary in the eugenics coal mine. We are giving the world a chance to think about the ethics of choosing which humans get a chance at life.